Streamcombe Farm … now there’s a name that conjures up images of rural tranquillity and bliss…the perfect antidote to the stresses and strains of the city, where life is simple and the living is good. 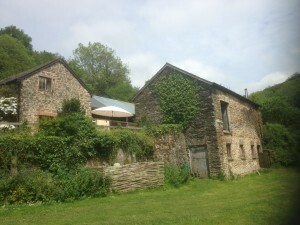 It’s just outside the Exmoor National Park, two miles from Dulverton in West Somerset. It’s a wonderful place for wild camping, and the perfect location if you want to get away from it all and recharge your batteries. Luxury B & B is available if you are after a bit of comfort, and you can also hire the delightful shepherds hut. We preferred the camping though. We turned up and were simply told to head for the meadow at the back of the farm. Facilities are basic. There are compost toilets and a safari shower. But this simplicity just enhances your enjoyment of the place. There’s a small stream or brook running through which gives your ears the sound of water trickling past you, day and night. You do get woken early (very early at this time of year) by the most vibrant and joyous dawn chorus you are ever likely to hear. You really don’t mind. The sounds of the various birds are so clear. They lift your soul before you drift off back to sleep. 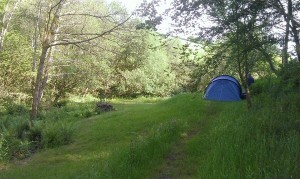 It’s idyllic, and offers the perfect venue for a summer camping trip. You can also book the farmhouse and stables for functions and get-togethers. We were there for a fiftieth birthday celebration. The owners Karen & Ian Jarmarkier laid on a simple barbecue with local sausages and burgers that put anything you get at the supermarkets to shame. Cookery and bread making courses, as well as team building courses are also provided by this resourceful and energetic couple. These may entice new customers to Streamcombe Farm. 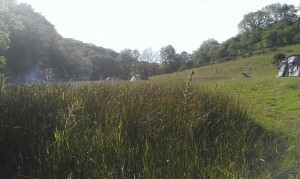 For us though, the setting alone and the simple delight of summer camping was enough.